The Förderverein Pfingstberg in Potsdam e.V. is committed to the preservation of the historical Pfingstberg ensemble. The association operates the historic monuments on Pfingstberg in keeping with the principle “preservation through use.” Several thousand euros in donations are required annually for the ensemble’s ongoing reconstruction and preservation, funds which the Förderverein Pfingstberg solicits and collects. Members of the association are also actively involved in the work to preserve the ensemble, for example, through the care and maintenance of the park grounds. Moreover, in the summer months the association organizes diverse cultural events under the title “Culture in Nature”. Would you like to become involved with very special volunteer activities in Potsdam? As an active member of the Förderverein Pfingstberg you’ll be working at one of the most beautiful locations in Brandenburg’s capital. But as a sponsoring member or with an institutional supporting membership you will also be supporting the work of the association. 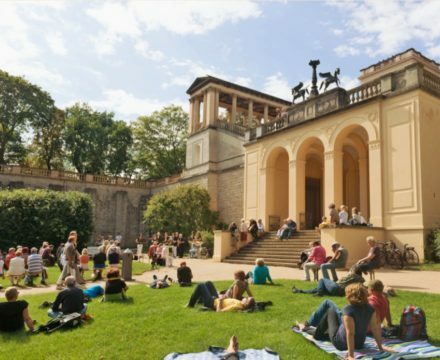 Continuous renovation work on the building substance and the gardens is necessary in order to preserve and maintain the Pfingstberg ensemble. Please help us with a donation, to preserve the site in all its beauty and historical significance for visitors now and in the future! The History of the Förderverein Pfingstberg e.V. It was 1987 when a group of young Potsdamers banded together to save the historical Pfingstberg ensemble from falling into further decline or ruin. 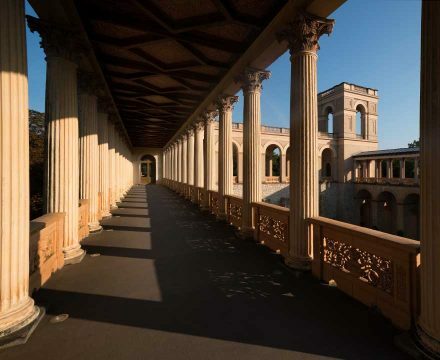 A reconstruction of the Belvedere would not have been possible without generous donations. In addition to substantial contributions from major donors, many private individuals and companies have supported the building’s refurbishment with financial or material donations, including Dr. Werner Otto and the Hermann Reemtsma Stiftung. Help us to preserve the unique historical grounds on Pfingstberg! With your donation we carry out necessary repair measures on the architectural structures and in the gardens.